Form2Pay makes form building accessible to novices looking to create a simple, functional web form. Its step-by-step guide will accompany you from start to finish, taking much of the anxiety out of the learning process. This focus on simplicity does have its drawbacks if you’re looking to create a more complex form, though: experienced form builders may have to look elsewhere for advanced form building capabilities. That said, they do have quite a few nifty features, such as form transactions, storage space, SMS notifications, auto-responders, and integration with Google Analytics. Form2Pay is a viable option for novice users, with fantastic prices, a full range of handy features and tools, and a user-friendly interface that makes building a form incredibly easy. Want to know if Form2Pay is right for you? This is where Form2Pay could use some improvement. Not only is the range of templates limited, they also lack in mobile responsiveness. With over 70% of internet traffic coming from mobile devices, this is a failure of outrageous proportions. Template Selection: Form2Pay has a dozen different categories, such as healthcare and education, offering a handful of forms to suit each category. If you are looking for unique, or cool-looking forms, we advise you look elsewhere. Customization: A feature called Form Styling allows you to tweak everything, from the background color to the font for the tool tip function. It’s pretty cool. Form2Pay Is Rich In Features! Form2Pay provides many free options and reasonably priced Plans. Form2Pay is offers a user-friendly design experience. Ideal for beginners, its step-by-step guide will accompany you from start to finish. You can add a new field, select a feature from the menu pop-up, add it to your form, before you move on to the next stage of the builder process. After you have bulked out your form, you will be guided over to the design process where you can choose colors, styles and other formatting options. With Form2Pay you can also set CAPTCHAS and security options to build a robust form, usable anywhere you like. 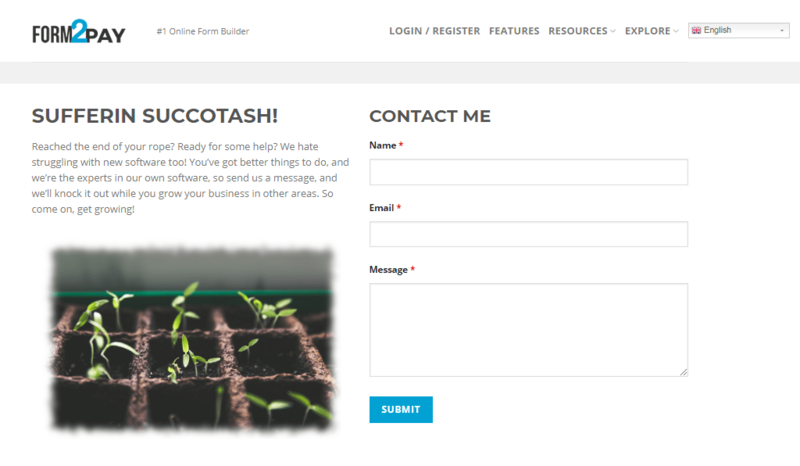 That said, the form builder’s simplicity can grow tiring for more advanced/creative builder-types. Live Chat Available To All! Form2Pay wins points against its competitors, by offering live chat to all users. The site’s DIY support, however, is fairly limited, no available forums and a very small article knowledge base. Most help is integrated into its step-by-step builder. You can fill out a support ticket, but the chat is also a very helpful option. Form2Pay offers good value for a reasonable price. The Free for Life Option includes unlimited forms and fields, anti-spam and 100 submissions per month. If you need eCommerce, we advise you to upgrade to the Business plan. At less than $10 per month, it provides unlimited Fields per Forms, Entries/Submissions, Reports and 15GB storage space. Upgrade to Premium Plan to expand your capacity to 20GB. All plans have a 30 day money-back-guarantee, so it is advisable to give Form2Pay a try. Form2Pay offers novice form builders and small business plenty of unlimited forms and fields. They’re not the most advanced and sophisticated form builders, but they have a solid list of essential features that promise to do the job. If you’re looking for a drag-and-drop editor or more quirky or offbeat templates, it’s best to look elsewhere. Click here to try Form2Pay.